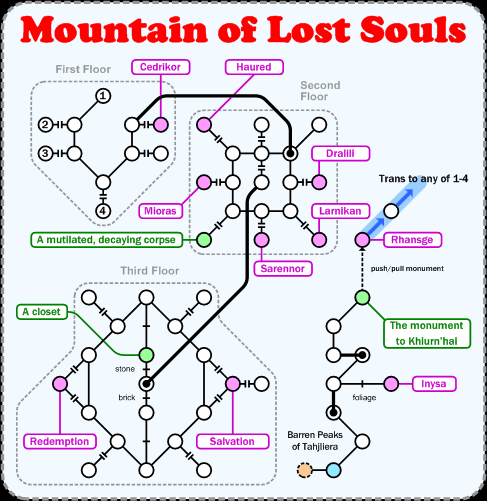 The Mountain of Lost Souls is a very clever and interesting area that requires a few different classes to work together. The recall room is the one marked with a 1. Most mobs past the second level (and all the ones whose names I've marked in) are IP1, so be careful. There's some very good equipment to be found in this area, such as the shades of light. Walk ( nw, 2w, 4n, e, look painting, open n, n, 49w, 8s, sw, 5w, 2sw, nw, 3w, d, sw, 2s, e ) to get from DH to the room marked in blue.